Over the next two months, we will be taking a close look at exactly what you need to put together a sound marketing plan for your small business. Whether launching into the market for the first time or simply planning for the new year ahead, we will take you through how to create a marketing plan that will not only give you achievable goals to work towards but also a way to measure exactly how successful your plan has been in achieving your businesses objectives. Week by week, we will look at each of the elements you need to think through to get your marketing prepared. First thing’s first, you need to understand where you sit in the current market. What is a situation analysis? In order to stand up next to competing brands, you first need to understand your niche market and where you are currently placed within it. This means being truthful about your current circumstances in a well-thought-out situation analysis. A situation analysis basically provides a snapshot of what your company is and where you stand in the market; it is the definition of your business in the here and now. It’s important to be honest and realistic in your development of this analysis. Be sure not to be aspirational but, by the same token, don’t underestimate where you’re at. It should be a true reflection of your business. To get an idea of where your business is at, you should be looking at your business strengths, weaknesses, opportunities and threats. This is often called a SWOT analysis. To develop your own, first divide up a piece of paper into four quadrants, one for each of the SWOT points. Why are our products/services better than others? What is it that makes us stand out? What advantages do we have that add value to our business? Start by brainstorming as much as you can. Just write down anything that comes to mind, then you can go back over it later with a fine-toothed comb. Next, it’s time to look at the other end of the scale: your business weaknesses. Write these down in the box at the top right of your sheet, next to your strengths. What detracts from your competitive edge? What’s stopping you from reaching your business goals/objectives? Again, don’t censor yourself as you brainstorm, just write everything down and come back to fine tune it later. Do people have a positive view of your business? Has the market recently changed for the better? Has a new technology been introduced that will benefit your business? Are there any upcoming events (on a local or global scale) that you can leverage for your business? If you haven’t already, do some research around this. The business landscape is constantly evolving and, while it’s important to stay on top of the specifics of your own industry, it also pays to keep an ear to the ground about the changes taking place in a more general sense. If you don’t, you may miss out on an opportunity perfect for your business. What are the obstacles in the way of achieving your business goals? Is there a new competitor in the market? Has a new technological development left one of your products or services redundant? Could a change in government affect your business? Do you suffer from any financial setbacks or restrictions? Once you have an exhaustive list of strengths, weaknesses, opportunities and threats, it’s time to go back and formalise them by condensing any similar points into a succinct list. Then, consider each carefully and, if you can, rank them in order of importance. Once you’ve done so, make a separate list of all the things that require immediate attention. This should be a combination of time-sensitive, high-impact and quick-fix problems. You should also identify anything that requires more research and look into those points further. Next week, in part two of How to write a marketing plan: Situation Analysis, we will look at how to draw up a competitor analysis to see where you sit in relation to other stakeholders in your market. 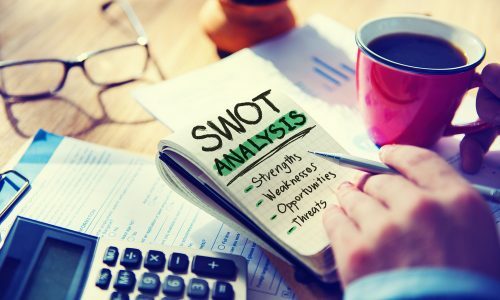 So, you have until next week to get your SWOT analysis going. In the meantime, if you need help with any digital marketing solutions to get your business on track for the new year, don't hesitate to get in touch with an Online Solutions Advisor.